Strawberry rhubarb is a flavor combination I have loved for as long as I can remember and is also my favorite pie combination! At the Ann Arbor Farmer’s market recently rhubarb was plentiful and I picked up a few bunches. Tempted to find new ways to use rhubarb, this recipe was created. Many of the flavored Greek yogurts on the market have quite a bit of added sugar. Making fruit purees or compotes are one way to add flavor to Greek yogurt while keeping it “clean”. 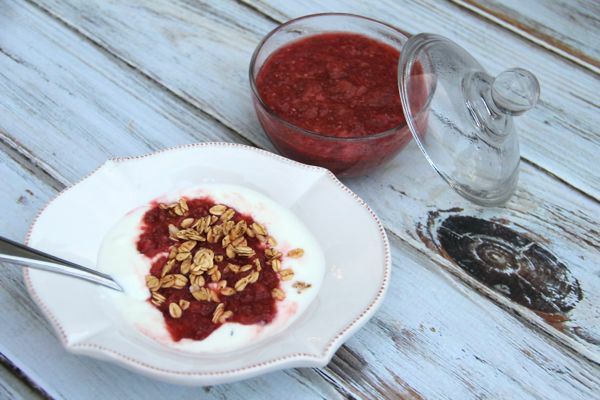 You can use this compote on top of yogurt like I have or you could also make a layered granola yogurt fruit parfait with it, spread it on toast or use it in baked goods to replace applesauce. 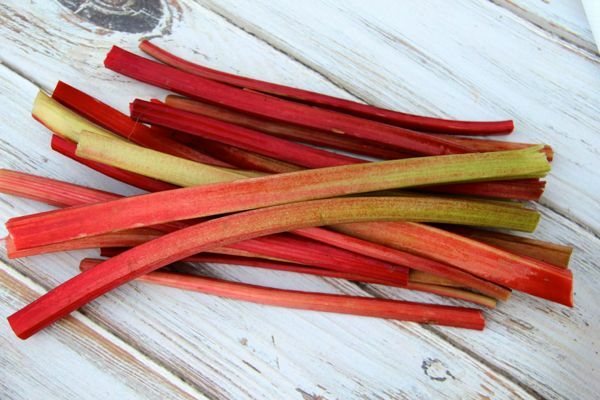 When purchasing rhubarb, be sure to avoid stalks that are limp and curled. Look for a deep red color in the stalks as they will be sweeter and richer. Rhubarb is rich in vitamin C and fiber. Rhubarb also contains vitamin A and K along with healthy additions of folate, riboflavin, niacin, B-vitamins, and pantothenic acid. Chia seeds pack a powerful nutrition punch and contain calcium, omega-3s, antioxidants, fiber and other minerals. Combine the chopped rhubarb and water in a saucepan and cook over medium heat stirring often about 5 minutes. Add the strawberries and bring to a boil then reduce to a simmer for about 10 minutes while stirring often. Use the back end of a large spoon to break up any chunky pieces and add honey and vanilla stirring well to blend. Remove the compote from the heat and let it cool for 10 minutes. If not using right away, cover and refrigerate the compote. I made these as a healthy snack for my daughter’s 3rd grade class, and they were a huge hit! The teacher asked for seconds! The bananas and strawberries kept them moist and the cinnamon added just the right amount of yum! Just made this as mini muffins, halved the recipe too. They were very good!! A little bit of crunch on the outside (especially with the strawberry on top) but perfect on the inside; not too moist or too dense. Surprisingly, my oven took 16-17 minutes to cook the minis all the way through. Thanks for the recipe! Perfect way to use my on0sale strawberries and bananas!